For professional artists and designers who want to add a world-class pen-on screen creative experience to their Mac or PC, Wacom Cintiq Pro offers Wacom's most powerful array of capabilities in a high-performance creative pen display. For professional artists and designers who want to add a world-class pen-on-screen creative experience to their Mac or PC, Wacom Cintiq Pro offers Wacom's most powerful array of capabilities in a creative pen display. 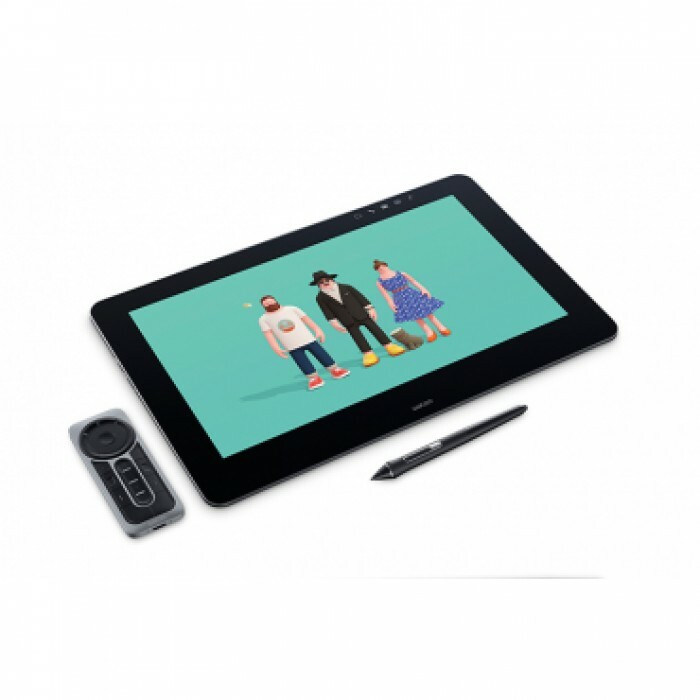 Featuring the Wacom Pro Pen 2 with 4x increased pen accuracy and pressure sensitivity*, high display resolution and color performance, and multi-touch control. Both the Wacom Cintiq Pro 13 (13.3" display) and the Wacom Cintiq Pro 16 (15.6" display) also feature a beautiful new design with an edge-to-edge glass surface and pop-out legs for working at an inclined angle. Wacom Cintiq Pro works with your favorite 2D and 3D creative software to give you the authentic feel, accuracy and control to create anything that you can imagine. With years of experience developing and innovating creative pen displays for professional art and design, Wacom developed the Wacom Cintiq Pro to inspire and support artists as they strive to do their very best work. The new Wacom Pro Pen 2 gives you Wacom's most accurate and advanced pen performance with 4x higher pen accuracy and pressure sensitivity*, outstanding pen-tilt response and virtually lag-free tracking. The feel of using the pen on the edge-to-edge, glass screen provides an authentic drawing experience and exceptional control for creative work. The new displays let you see your artwork in perfect detail with up to 4K resolution and exceptionally high 94% Adobe RGB color performance. Intuitive multi-touch gestures speed your workflow, letting you zoom, pan and navigate with a sweep of your fingers. You can also customize your workflow with programmable on-screen Radial Menus, and pen side switches or you can add the ExpressKey™ Remote (sold separately) for additional shortcut keys and navigational controls. Cintiq Pro is also integrated into your workflow using other Wacom products, software and services. Download the Inkspace™ application to benefit from valuable services such as Wacom Echo to protect your precious creative work from loss by automatically storing a back-up in the Wacom Cloud. Both sizes of Cintiq Pro are designed specifically for the needs of creative users. Choose the larger Cintiq Pro 16 for additional space to work and higher resolution and color performance, or the more compact Cintiq Pro 13 that blends performance with easy portability - from computer to computer or place to place. Wacom Cintiq Pro is flexible and has valuable accessory options (sold separately) to customize it for your unique creative needs. The Wacom Color Manager helps you calibrate your display for use in color critical workflows. The accessory stand provides two additional working angles and folds flat for easy transport. Experience the joy of creating with the new Wacom Cintiq Pro!